Worship is the proper response of all moral, sentient beings to God, ascribing all honor and worth to the Creator-God precisely because he is worthy, delightfully so. This side of the Fall, human worship of God properly responds to the redemptive provisions that God has graciously made. 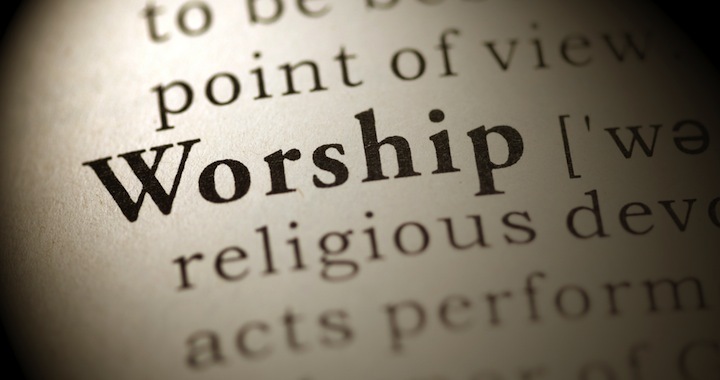 While all true worship is God-centered, Christian worship is no less Christ-centered. Empowered by the Spirit and in line with the stipulations of the new covenant, it manifests itself in all of our living, finding its impulse in the gospel, which restores our relationship with our Redeemer-God and therefore also with our fellow image-bearers, our co-worshipers. Such worship therefore manifests itself both in adoration and in action, both in the individual believer and in corporate worship, which is worship offered up in the context of the body of believers, who strive to align all the forms of their devout ascription of all worth to God with panoply of new covenant mandates and examples that bring to fulfillment the glories of antecedent revelation and anticipate the consummation. —Worship by the Book, ed. D.A. Carson, contributors Mark Ashton, R. Kent Hughes and Timothy Keller. Reformatted for readability.